In today’s post I’d like to acquaint with an Irish designer that you simply must know. Richard Malone hails from Wexford and was part of Fashion East’s spring 2016 line-up. The designer occupied L’Escargot—a French restaurant and member’s club—on Greek Street for the Saturday. Working with Irish artist Evelyn O’Connor, the Georgian town house was transformed into a plastic-sheared stomping ground for the street-cast models. The slightly peculiar set aside, the show was truly unforgettable. Finding inspiration in his mother’s work uniform, Malone translated the workwear uniform into his collection with a quirky sensibility. Who knew an Argos work apron could be translated into something oddly fashionable. 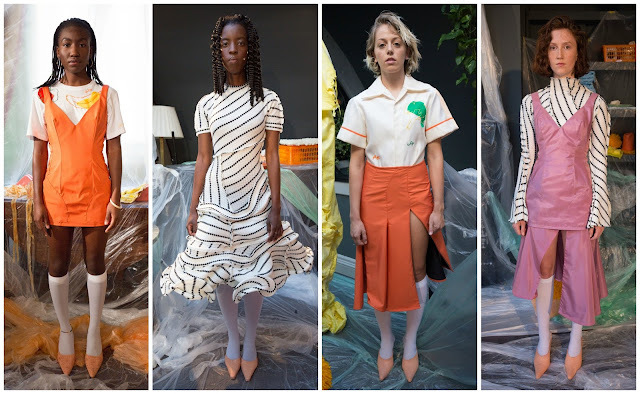 There was a structured, loud orange blouse paired with a multi-coloured skirt, and also an off-white shirt with a large collar, orange piping and a broccoli accent. Simple pencil dresses were taken to with a knife, adding a deconstructed flair. A bubblegum pink high-waisted look was slashed, as was a pleated orange look. A cookbook passed down from Malone's grandmother to his mother also inspired the collection. Fruit and vegetables, in a funky pop art way, were stamped on looks. A tomato, a banana, broccoli. One top had the words “chip” and “fluff” on it. Humour and style go hand in hand sometimes. If you read an interview with Richard Malone you’ll hear him refer to showpieces. The showpieces in his collections are black and white dresses with architecturally sculptured skirts. The beauty of them is that, as he told AnOther magazine in September; “I’ve made mine so that they’re machine washable; just throw them in and they’ll be fine at 30 degrees. Plus, when you’re travelling, you can just roll them up and stick them in your bag - they won’t crease, and they’ll pop back into shape.” Malone credits his working-class background as the reason for this thought and consideration. “You tend to think about the practical things like that.” The showpieces here boasted large, full skirts but they weren’t gargantuan and uninviting. They were subtle and quite lovely. 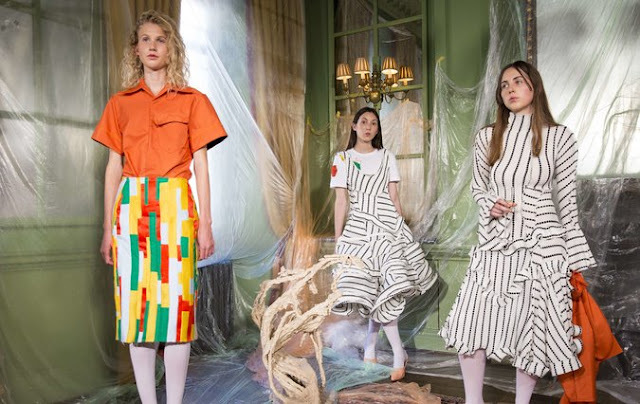 Richard Malone was the recipient of the Deutsche Bank Award for Fashion at Central Saint Martins, and also received the LVMH Grand Prix scholarship after completing his BA at the prestigious college. Since then, Malone has been slowly developing his brand, working with clients that order made-to-measure garments. The above awards don’t necessarily guarantee success—Malone made his previous collection on the floor of his childhood bedroom. However, this Irishman is building a business, one grounded on customer consideration and a fresh outlook on fashion. Malone is creating success for himself, those awards are just reminders that he’s one of the best upcoming designers.